It’s been a busy month. 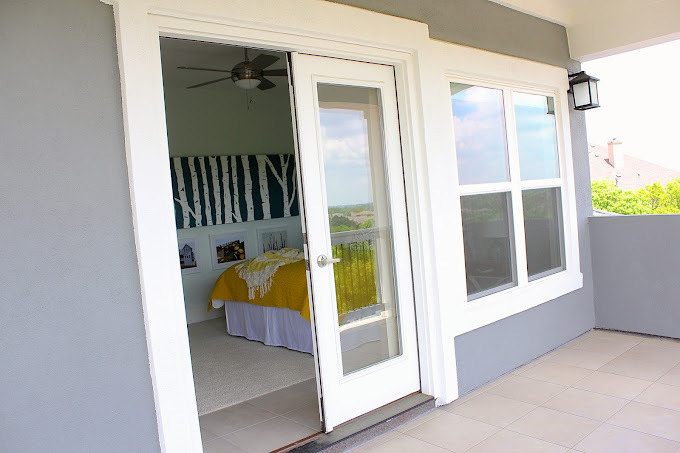 Which means…the guest room is done! SW 6483 Buoyant Blue • SW 6469 Dewy • SW 6476 GlimmerAnd they all would have been beautiful for a Beach Home concept. But I decided to keep it as light and subtle as possible. So I went with SW 6476 Glimmer. And, oh, it’s a pretty shade. and there’s a whole lot of other stuff in between…. I sorta wish this was my room. Here’s what we did…For this project Sherwin-Williams asked me to try out their top-of-the-line Emerald™ paint. And it is beautiful, thick and creamy, it rolls on lovely, and really looks gorgeous. 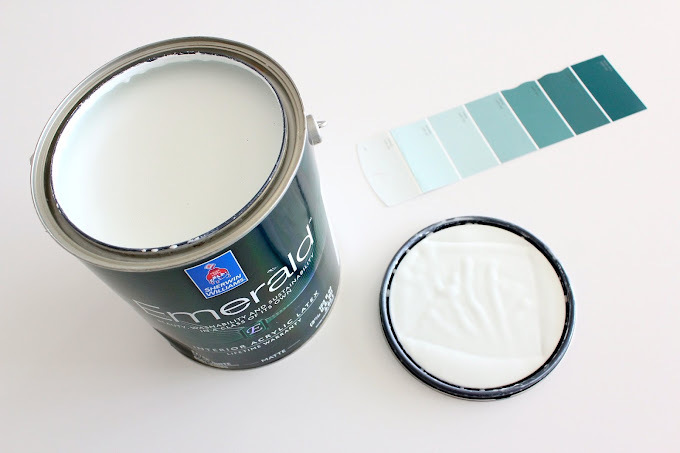 And the beauty of Emerald™ is it’s paint and primer in one, which is great when you’re painting over a darker color. Deciding on a light color can be tricky unless you look at the deep tones it originates from. When I’m selecting a pale shade, I look for the darkest color of the paint chip first to find the shade that goes with my room aesthetic and other furniture I have in the house. When I’ve narrowed that one down, I move up the paint chips until I find the perfect lighter-shade complement to that dark one. This keeps you from ending up with a color that’s “too blue” or “too purple-blue” or “more of a green gray”…or whatever unforseen undertones and colors you weren’t expecting. The other great way to select your paint is to use the Sherwin-Williams color tools. They have a variety of cool options. And you can also follow them on Facebook, Twitter, Instagram, Pinterest, and YouTube for painting tips and design ideas. 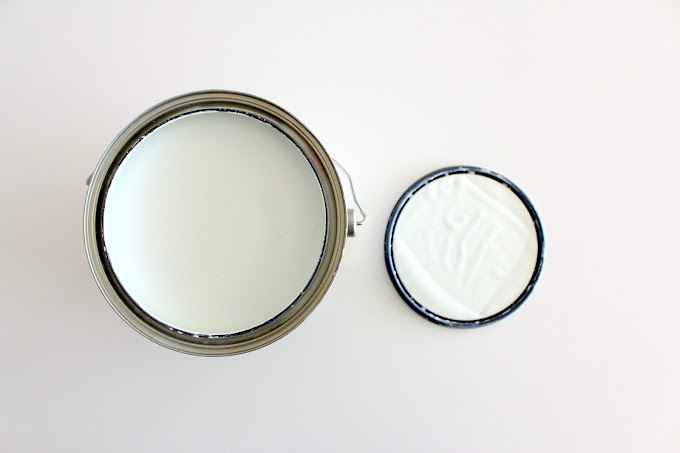 For this project I used the Chip It!® tool (which is seriously rad) because I wanted the paint color to match our fireplace tiles downstairs (read more about it in my other post). And it totally does! I then used the ChipCard and quart-size samples to paint on the wall and determine my final color. But the funny thing is–without even realizing it–I had selected the exact paint chip that also matched the dark tones in the room! Look at the dark shade on the color spectrum above. It matches the birch tree painting perfectly!…a painting which I made a few years ago. I knew that with SW 6476 Glimmer, I was on the right track. It coordinates with all the dark colors in the room, and it has a very airy vibe. Don’t be fooled by how light-colored the paint looks in the can. I’ve learned over the years that paint looks slightly darker when it dries than when you’re rolling it on. 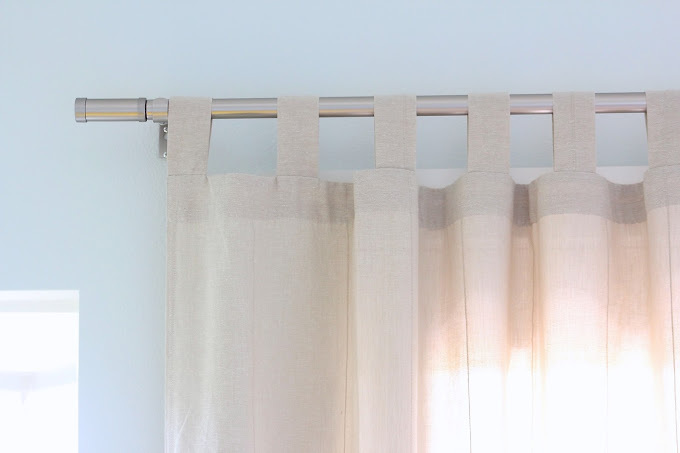 And even subtle shades can make a soothing impact in a room over plain white walls. So don’t be scared to go light! Okay. With my color selected, and painted, and looking fantastic in the room…I needed to decorate. And just like writing a school essay, the hardest part with a new room is finding that thesis statement–or that special piece that gets you on the right design track. And these tables were my thesis for the room. I’d been eyeing them at Target for months and finally went for it. And then little by little all the pieces came together around those tables…like the seaglass lamps and the basket above (Target) which can be used for holding laundry…cause whenever I’m traveling, I end up with a pile of dirties in the corner of the room. Now there’s a place to put them! 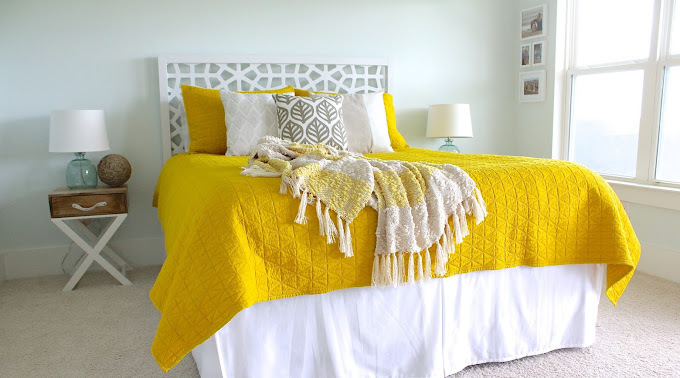 The yellow bedding is from Target as well, the Morocco headboard is West Elm (scored at the outlet store), the curtains are IKEA, the little cabinet was a consignment store find (it goes so great with the headboard), and the oversized dandelions are from my tutorial here. With that soothing blue paint as the backdrop, the room really came together. And to finish it off, it needed a personal touch. But I wasn’t sure what that touch was until I found this old book at an Antique store. I thought about framing some of the pages to hang in the room. But I kept it intact in this cubby for guests to enjoy, along with an extra bag to use (in case they need one). 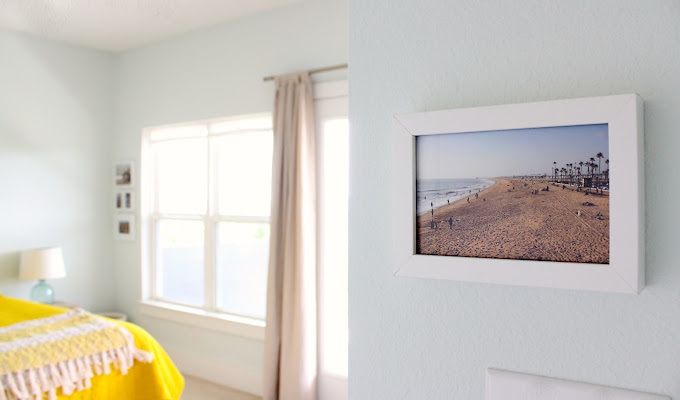 And instead I printed and framed my own beach photos and ones I’ve gathered from family members. Ah ha! Duh. That’s the perfect way to give a room your personal stamp. Of course I wanted the photos to go with the color scheme, which wasn’t hard since the beach is filled with pretty blues and yellow sunsets. 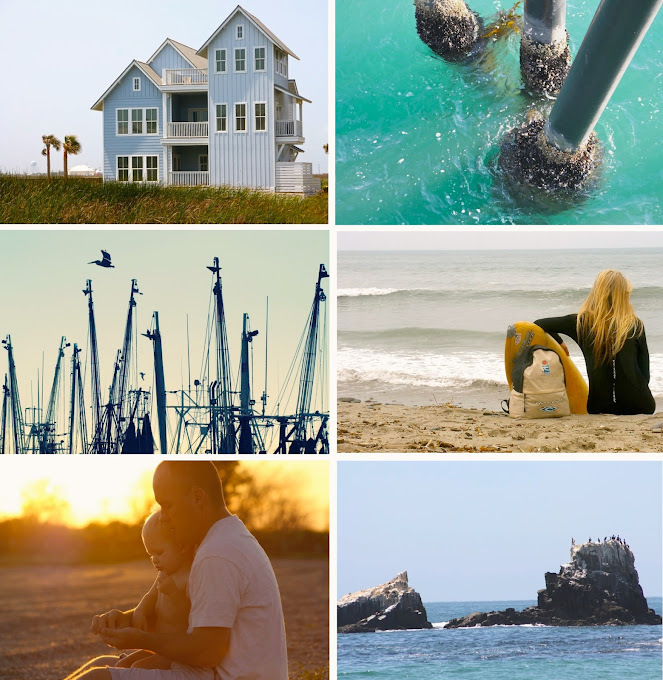 These photos were taken at various California beaches from Ventura to San Onofre, some are from Texas, and the beautiful photo of the boat masts and pelican is by the lovely Katy Dill. She posted the photo a few years ago on her blog, and I asked if I could use it somewhere in my house one day. I’m glad those masts found the perfect little spot in this room…along with sandy eyes Owen. 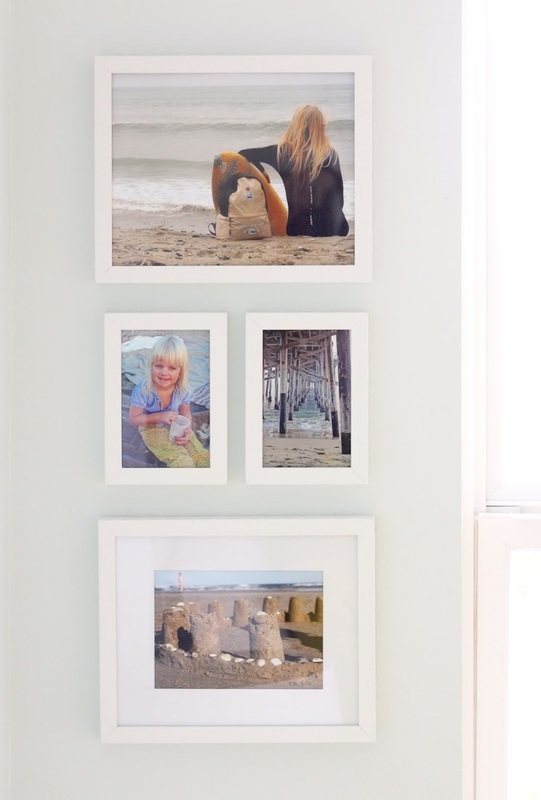 I bought simple white frames from IKEA and placed the large prints on one side of the room. 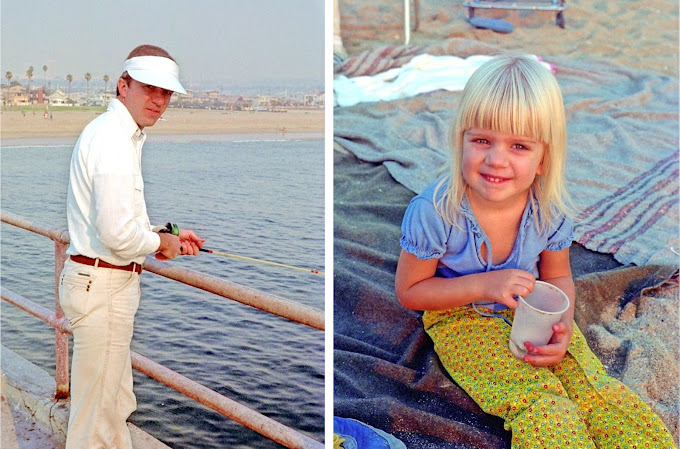 And on the other, we have old shots of my family from the late ’70s beach days. Here’s a shot of my Aunt Sandy and my mom holding my younger brother, Eric. And the photo on the right might seem weird, but it really makes me smile cause it brings back memories. We spent many summer days and evenings hanging out at Corona Del Mar, Newport, and Huntington Beach. And aside from all the sand crab-gathering and boogie boarding…we loved looking for soda cans on the sand and in the big dumpsters! Haah. We’d take them to the recycling center and earn a few bucks from it. So when I saw this funny pic of my cousin, Amy, and sister, Saunja, I had to put it on the wall. I’m sure I’ll have more photos to add as the years go by. But for now the guest room is ready. Whether it’s day or night, our Glimmer walls, Pure White doors, and Cityscape painted home is open. We hope some guests stop by! And now, would you like to give your own space a makeover? Sherwin-Williams is offering a $50 gift card to one of my lucky readers. So leave me a comment about the room!….and someone please tell me what I should hang on the wall above the bed?! Casey says a fish (no). I’m thinking some driftwood…. I’d transform our guest room. Right now it’s more of a “garage,” holding way too much extra junk! It desperately needs some transformation! I am ready to transform my bedroom. It is the last room in the house with yukky carpet and the walls were painted when I was in my “Trading Spaces” period and let me just say they are awful. My master bath is desperate for color and attention. 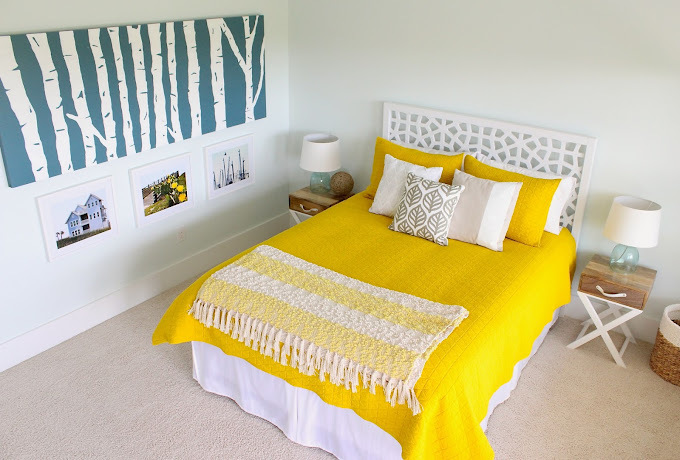 Love your guest room, especially pop of yellow. I thought that was something only my family said! I’d use it on my parents’ livingroom. They are moving soon! I really want to paint my master bedroom! I finished a DIY headboard not too long ago, and it would be great to finish the room out with paint! I think I would redo our master bedroom. 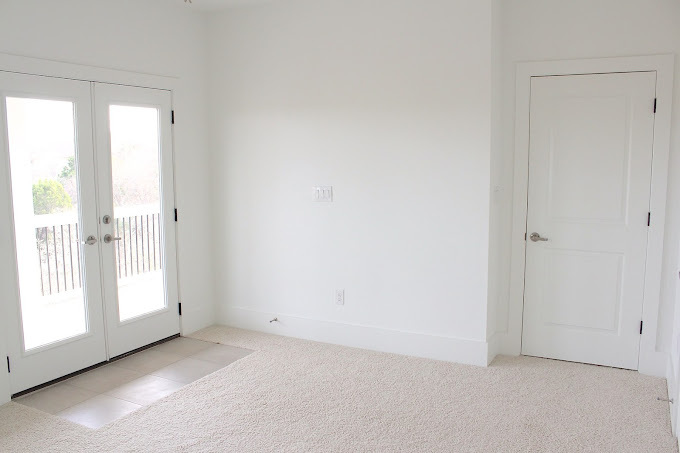 I would love some fun paint on the walls to go with some rich hardwood floors. I really want to paint a wall other than white! This room is beautiful! I love the wall color. I’m a sucker for any shade of blue! Gorgeous! I would love to do over my living room, it feels stuffy and uncomfortable and would love to make it more family focused. I would love to paint my sewing room, which was a little boys John Deere room before I moved it. Just picture the bottom half of the room painted John Deere green, a simple pine board acting as a chair rail painted yellow and a beige upper wall. It’s been 5 years and needs a makeover! I desperately need to tackle all the bedrooms in our (new-to-us) super old home. We just bought and moved into a house with an orange dining room (bright!) and a dark dusky blue living room (think 1980s country cute) and a dirty sunshine yellow kitchen – what room wouldn’t I want to make over?! I love the color you picked for your room! great giveaway! we are planning to paint our entire downstairs this summer, I’ve hated the color since day 1 (too yellow) but my husband had already painted one room by the time I saw it and new carpet was coming later that week so I had to live with it. Oh, the bright yellows are so cheerful! We’re starting the painting process at our house . . . I love this space – it’s so fresh and clean! I grew up in Florida, and now live in Indiana, so I’m always looking for beautiful coastal inspiration! I want to paint our dining room! I live in a log home so the only room I can paint is a bathroom, and our family bath could really use it! Oh wow! This is such a beautiful room! I love the color combo you chose…lovely! My parents just bought a beautiful home in Tampa, Florida and are planning on renovating a lot of the rooms. I keep sending them links from your blog because they want to do the wood tiling like you and are having a difficult time choosing paint colors. Thanks for all the tips and for a giveaway chance! 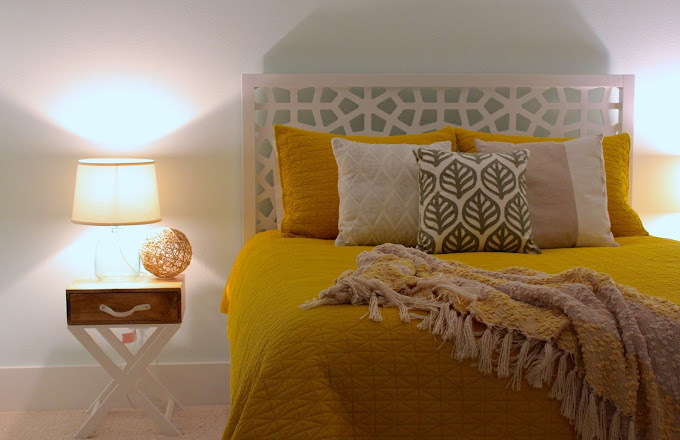 Your guest room looks great, Dana! I’d redo my own guest room too- it’s this funky hazy purple that just sort of makes me uncomfortable. This room is beautiful! I would love to transform our current “guest room” (so-called because it contains the guest bed) into a room for my two girls to share. Paint and decorations are very necessary! I need to find the perfect paint for the giant closet doors (seriously they take up an entire wall) in our nursery for baby boy coming in two months! I was ild transform our master bedroom. It’s currently sporting 3 different paint colors! Has been that way for three years too. Must do something about this! I would repaint my Master Bath – I have always hated the color and now want to paint it Glimmer like you!! I love the room! 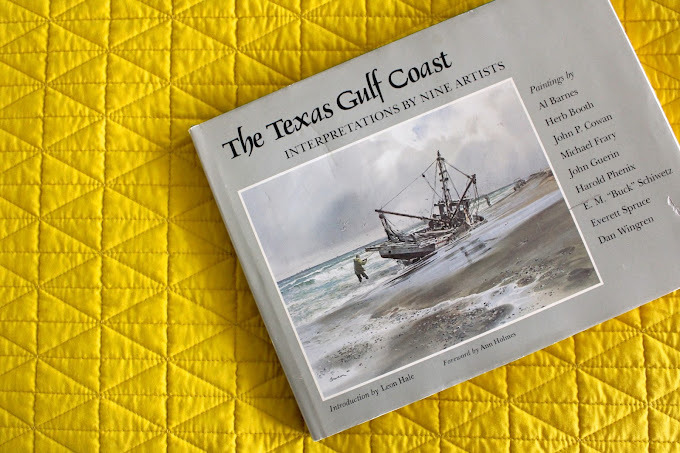 Maybe the Texas gulf coast book could double as a guest book. 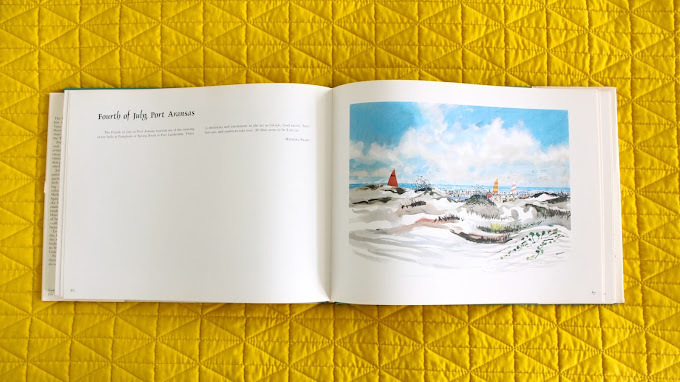 Your guests could sign and date (or leave a message) on the blank spots on the left hand sides of the page. Great design choices! I’ve always loved your aesthetic. Our upstairs bathroom really needs new paint. Right now it’s green with the rag painting effect. Not my favorite and rather dated. We just moved into our first home this past weekend! So, we have lots of projects; however, painting my 1 year old sons room is close to the top of the list. I would love top repaint our living room. I do not like the color at all. We’re looking for a house to buy right now, so I’m sure I will be painting a lot! I love the color you chose! I think it would look amazing in our family room. We are close to buying a home and it could use some new paint for sure!! I would like to repaint our bedroom. It is a blah tan color that I liked when we first moved in 6 yrs ago. Now I can’t stand it and I’m ready for something with a little more character. I’d love to redo our bedroom and the workroom! I’d transform our bedroom! 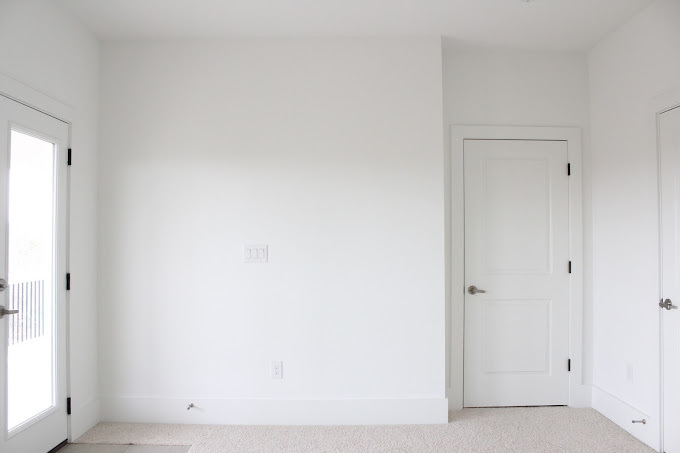 We were in a rush to move in (it took us a month to get the house clean and liveable and I was 5 months pregnant) so we painted all the walls cream and all the trim white. It’s been 4 years and ‘m ready for some COLOR! I am completely in LOVE with your guest room. Considering the same color in our new home…maybe our guest room? Thanks for the post AND the giveaway! I’d love to paint my art room where I teach. Love your colors! I’d transform any room of my house – they all need it. But I’m currently working on rearranging the living room so I’d start there. Your room is lovely! Ohh I would paint my bedroom! I’ve been itching to get rid of the boring beige on the walls for ages! How beautiful your guest room is ,,, All of my rooms need it but the guest bedroom and bathroom need updating the most .. I would probably start with my family room and adjoining hallway. However, our entire interior is in need of repainting since it is covered in doggie blood splatter. I kid you not! The dog must have lost a teeny part off the tip of her ear and I didn’t notice for a long time. (We run in the woods 5x’s a week, so scrapes are normal.) So long, that every time she shook her head…in every room!…she left tiny dots. I found them from time to time and cleaned them, but it probably took me a month to realize they were EVERYWHERE and coming from her ear, which took forever to heal. Sigh…I need paint. Lots of paint! paint? yes please! want to paint our entrance turquoise blue! Can I live in that room? I love the colors! I would love to win this sweepstakes because I recently paint our guest bath and I hate the color. 🙁 I am hoping second time is the charm! I’d transform my bedroom! It is always the neglected room because nobody ever sees it, but I’d love to make it look nice! I would update our living room. It’s ready for a face lift. Love your home! I’d re paint my basement! 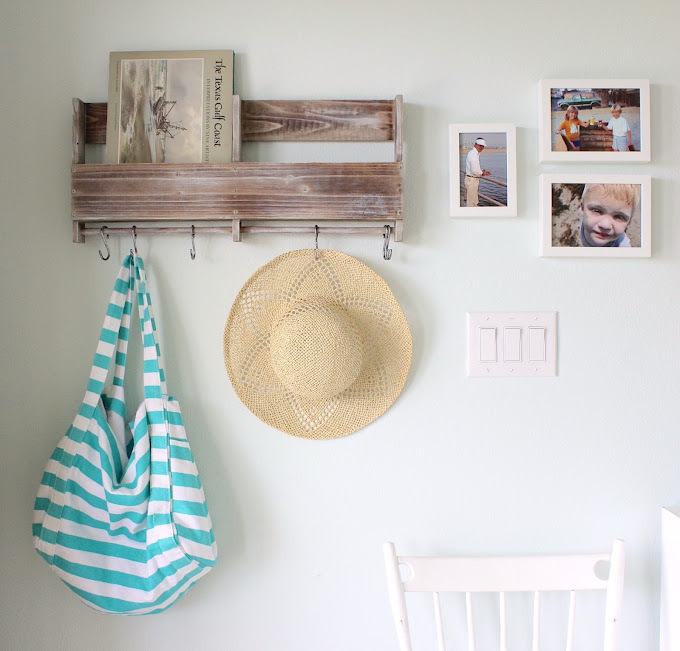 I am hoping to paint our mudroom this summer! Definitely my living room. It needs so much love! I seem to never get to finishing my master bedroom. I’m always working on the rest of the house. It’s definitely time for me! My room! It is so, so dark and needs a light shade. I love SW paint! We’ve used it in almost our entire house and have regretted the times when we have used another brand. I would use the giveaway to paint our bathroom (one of the rooms I regret using another brand in!). Thanks for the chance to win! Such an inviting and vibrant guest room 🙂 Thank you for this opportunity – I love SW paint! Love the wood shelf with hooks, where is it from? Your guest room looks absolutely fantastic! Thanks for sharing. If I won, I’d transform my boys’ bedroom. The bed needs some new paint and the walls are looking mighty drab these days. What a great room! I’d love to come stay there! But since you don’t know me that might be weird. Well done. I wish I was a talented decorator like you! I’ve wanted to redo my living room forever, it’s what is looked at first in my home, and right now it says nothing about the family that lives here! I’d redo my kitchen. It’s dark and could really use some brightening up! My bedroom. It needs some help. It is a sad room, that we usually only sleep in. 67) Heather @ What Does She Do All Day? I’m gearing up to transform my kitchen! My work space/yoga room. It’s become a storage space for everyone’s stuff. This credit would give me the inspiration to redo it. I love Glimmer! Great choice! My daughter’s room needs a paint makeover. It’s been almost 15 years and it’s time for something new. Thanks! Our kitchen needs some fresh (Sherwin Williams) paint! Thanks! I would love some free paint!! We are renting and my kitchen is a very weird red right now. I would love a light teal to be in there or a sunmy yellow! I would love some free paint. My kitchen needs a makeover! We moved into our house a year ago this week and still have a quite a few rooms to make ours. I think first on my list is the front living room/dining room. Picking a color is tricky as it is open to the kitchen (blue with yellow tile) and leads down the hallway. I really love the color you went with! The top of my list is the kitchen. It would look amazing in the same color (Glimmer)! I would update my lavatory and adjoining hallway. It is a lovely sage green, but I am getting the house ready to sell, and need to neutralize the color palette of our little homestead. That room is gorgeous! I love that wood shelf you have on the wall next to the door…gonna have to find one like it! Now that school is out for the summer, I have given my teenage daughter a bedroom make-over budget. so the paint would be perfect for her. I would redo my sons room. It needs some serious help. The guest room is absolutely beautiful! Considering we have a baby on the way I’d love to paint the nursery! Hands down, the dining room of our new-to-us house, which previous owners spent a lot of time getting just the “right” faux finish and I love the idea of primer + paint in one to cover it up ASAP! Thanks for great tips on shooting color, as well. Either my pantry/laundry room or my craft room. Those are the only two rooms we haven’t done anything to since we bought our house. Our office. Or maybe the garage! My kitchen is desperate for a fresh paint job! What an amazing bedroom! I love your style 🙂 I have never seen a guest room that beautiful. Your guests are going to be in heaven! I would redo my oldest daughters bedroom if I got the chance. My daughter’s room is a jarring shade of yellow and she’s looking to change it to something a little more soothing. Paint + primer sounds like the way to go! Thanks for the giveaway. Love the room! So beautiful! I think my almost 6 year old is ready for a big boy room! my room! The time has come to get rid of the brown walls it came with, and give my husband and I something pretty to wake up too – the whole thing needs a face lift!!! My guest bath needs an update. A fresh new color would be great! gosh, such a beautiful room!! love it. My living room needs a makeover big time. Would love to paint it!! I would start with either the master bedroom or the nursery. Everything is still white from when we moved in over a year ago. Every room of my house needs a makeover but I’ll start with the guest room since no major changes is required except paint and decorating. This is beautiful, Dana! Thanks for the advice about light colors. I have definitely always strayed toward the darker/richer colors, but I always end up pinning light and bright rooms as my favorites, so I’m learning that maybe the colors I have always chosen aren’t actually my style. As far as over the bed, I personally don’t know that I’d do anything. With the graphic detail of the birch tree painting (which is beautiful, by the way) and the texture in the headboard, it might just get too busy unless it’s something quite simple. Like a mirror? Awesome transformation! We’ve used SW for our whole house and LOVE it! 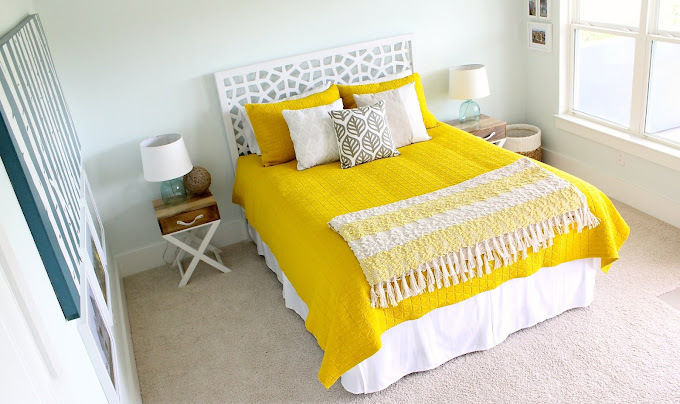 My favorite part of your room is the yellow bedding…might need to go get that! I love what you did in the guest bedroom. The colors are inviting and makes you feel at home. I looove the colors, the headboard, the wall color (fantastic!) and the entire room! You have a great eye for this!! For above the bed.. I like the idea of driftwood, or else a few old wooden wheels (or the actual steering wheel from a boat… the spindle kind, not sure what they’re really called?). Would be a dream to win some gorgeous paint! We have many rooms that need redone. Love the Glimmer color… might have to use that for my bathroom! I love this room! I always like rooms that look bright and clean. We are getting ready for a new baby at our house and I would love to finally add some paint to the walls! The basement! It serves so many functions and needs new paint to help inspire everything that happens in it. We love Sherwin Williams paint. It has served us well. Thanks for the lovely look at your successful guest room. Many blessings! Your room looks great Dana. I’d love to stay there. A suggestion? 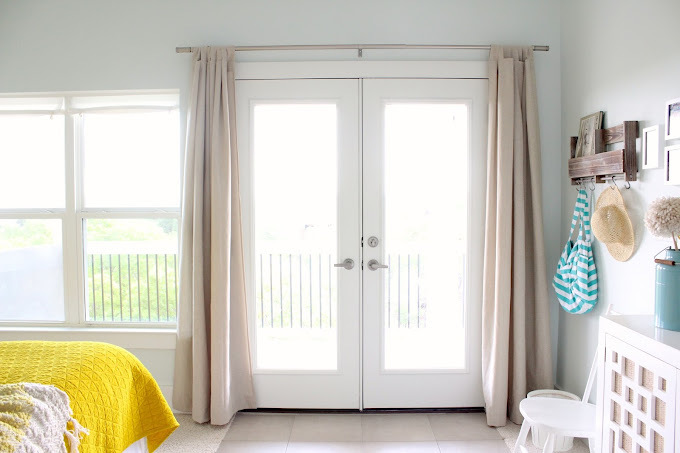 Get a collapsible room divider that can be placed outside on the deck (which is the BEST feature of that room IMO) where guests can sit outside to watch the day begin in a plush spa robe with a cup of coffee. Heaven…. 🙂 (JCP sells fluffy spa robes for cheap). Seriously love this room! We’re redoing our laundry room and this color would be awesome. Do love the yellow also! Awesome room! Have any vacancy for this weekend? I’d do driftwood too… Bring some warm texture to the room. As always, Dana, you don’t diappoint. I love everything about this room. So peaceful and cheerful. I just might take you up on the offer and stop by to visit some day. We are after all neighbors now that I live in San Antonio. 😉 We’re in the process of moving into a new house too and am super excited to start painting and decorating!!!! Your giving me some great ideas and tips. Thanks. I love the bright yellow and light blue. I love Sherwin-Williams paint also. We never use anything else in our house. Beautiful room!!! I definitely need to redo my laundry room. Love this room! It is now our inspiration for my oldest daughters new room! I love the makeover! A wood feature of some kind over the headboard would be lovely and tie into the side tables well. If I win, I would makeover our master bedroom! It’s the only room in our new house we haven’t touched. That color is so soothing. Love the room. I love that birch tree painting. Have been wanting to do my own for a while. The room is beautiful! We are getting ready to paint our bedroom and trying to decide on a color. Gorgeous room. I’d love to have you come help me with my decorating. Driftwood does sound good. We are moving my son into his “big boy room” so I’d love to give that room a more boyish paint color! Thanks for the chance to win! i love the idea of hanging driftwood!! the room is gorgeous! What a fantastic job you did with the room! I also vote for some kind of cool driftwood piece above the bed. I would love the chance to win some paint! My kitchen is screaming for a new look. This looks great. I love how much intention and meaning was put into it. Above the bed I think some driftwood that you were able to plane down and paint with your beach colors a simple graphic pattern would be great. Something like this, but with your colors and a large piece(s) of driftwood instead of barn wood. I love that shelf/cubby on the wall! The room looks amazing. 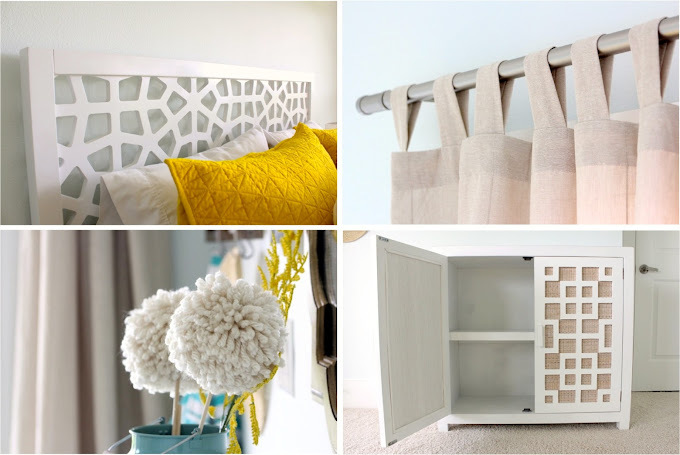 Your guest room turned out awesome! Would love to redo mine! Thanks for the opportunity to win. I’ve been eyeing those nightstands. They look perfect in there! Would love to redo my 11 year old’s room, she ready to rock a new “grown-up” color. Thx! gorgeous room! id love to use the chipit tool to redo our daughter’s room! Holy cow. Mark looks so much like your dad! That picture! Love the room, and all the little details. Hope we get to see it in person someday soon! 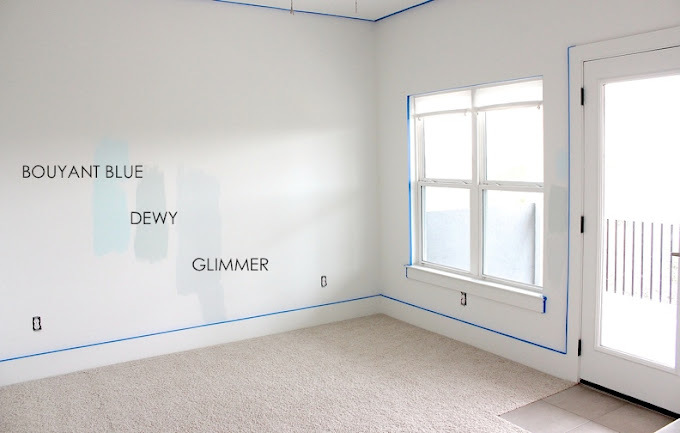 I might have to use Glimmer in my kid’s room when we paint! It’s perfect. And I hate to disagree with you, but I think a fish would be a good option above the headboard. I want to paint our living room (also the bedrooms, kitchen, and family room–but I think LR is first on the list! we got the bathrooms done already 🙂 ). I’m leaning towards a very light greyish blue. Driftwood yes:) I love your room! Is beautiful and looks so relaxing. I wanna come stay! Love the color choices! I love the color on your walls so beautiful and relaxing for guest! I hope I win!! I love how like you it looks. Our entire house is always in transition……I love to paint!! The room looks great! Blue and yellow are my two favorite colors! 😉 I think driftwood would look amazing over the bed…or maybe some sort of rope-knotty-fishnet-thing? I also LOVE that color, I’d love to paint my living room a calm fun color! I just love your guest room! SWOON! I think driftwood would look gorgeous above the bed. That color is PERFECT! I’d love to makeover my bedroom…it’s in desperate need! Keep your eyes peeled for some drift wood for sure. It’s hard to find good pieces. Each is so unique. Would look great in that room. The first thing that popped in my mind was “driftwood” when I read your question, even before reading on to see that was what you had in mind. I think it’d work great with the theme and bring a little outdoors inside. That paint color is great, it looks so light in the can, but amazing on the walls! My master bathroom and bedroom as in need of some sprucing and definitely need color! This is wonderful. The room turned out quite magnificent! I’m sure you’re excited. Love to paint my guest bedroom as well. Where did you get that print of the birch trees? It is gorgeous! I would love something like that above my bed. We’re about to move so I’m going to need a ton of paint! I love the colors and decorations you chose. I would not put a fish above the bed! Driftwood would be nice. Also, you could look for something fun and unique on etsy. If I could do one room in my house, I would definitely makeover my den. I love the room and would love the gift card to work on my girls’ room. I love their paint. I adore this room! My spouse and I are currently redoing an old house room by room and this is so inspiring. I love that you use pieces that an average person could go out and find easly without breaking the bank. What about putting some kind of ship in a bottle type art or piece above the bed. Maybe a modern take on the old fashion style? Dana, this looks gorgeous. So serene – warm but uncluttered. I’m in the process of picking paint for my daughter’s bedroom (it was never updated when my son moved into his new room and we turned it into a nursery for her, oops! ), so the paint picking tips are so helpful. I think I’m going back to the drawing board/chip board! I like the driftwood idea — no fish!! — or maybe a wooden glass enclosed box (are those called shadow boxes??) filled partially with beach sand? And you could paint the wooden frame to look aged and driftwood-y. 🙂 Whatever you pick, I’m sure it will look spectacular! I am glad you decided to use your own photos. Above the bed: How about a fish made of driftwood? Beautiful! I’d love to revamp our master. Drift wood above the bed sounds good, but I always love the shabby painter wooden buoys, too. I would like to makever my bedroom, I had silvermist by SW at our old house and loved it. I love the look of the room it looks so nice and clean. I think I would hang several different sized star fish over the bed to really give it a beachy feel. The room is gorgeous! Perfect color on the walls, and the photos are great! I have one room left to transform in our 90s house…the main powder room. I’m thinking Glimmer would look fantastic! A b & w print of a fish skeleton (although, that could be scary) or a fish bleached into driftwood. I think some driftwood would look great over the bed. 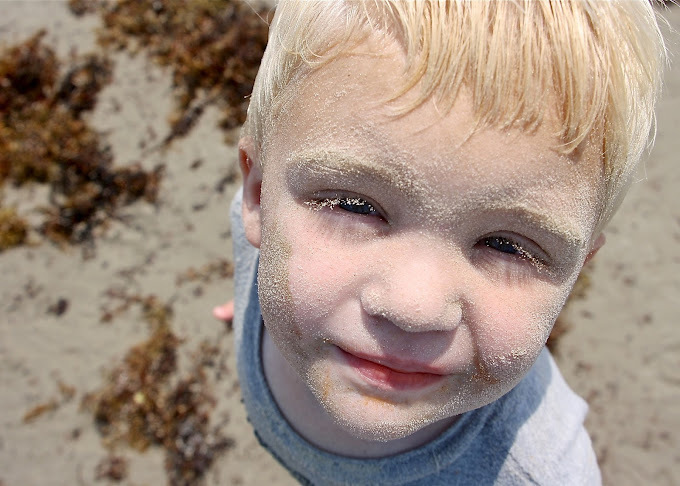 Maybe with a great sand dollar or starfish leaned on it. With the paint, I’d re do my big living room and dining room area. It needs a facelift. Thank you for the tip about looking at the darkest color of the paint chip in order to find the right lighter shade. That is genius. I also agree with your driftwood idea and you could even satisfy Casey’s request for a fish with a driftwood fish-shaped art….or something else like a driftwood/shell wreath. Maybe a driftwood mirror over the bed? It’s gorgeous!!! We put together a reclaimed wood piece that is hanging over our bed and I adore it. My living room is begging for a makeover! Lovely room! I think some driftwood would be perfect it would warm up the walls just a bit! Your guestroom looks superb! I would put a driftwood whale or seahorse above the bed. I need to transform our guest room. We bought this house last year and the guest room is painted chocolate brown….with chocolate brown stripes. The difference in the stripes is that one paint is matte and the other is semi-gloss. Some people can probably carry this off, but I can’t. I would like a lighter look! Sherwin Williams makes the best paint! Yes! I love the wall color. Fresh and soothing at the same time. The room came together beautifully! How about some seagulls above the bed? Our guest bedroom needs new paint. Well, I’m in love with this room. I love the wall color and really appreciated your tip on looking at the base color to coordinate. Duh! I hadn’t really thought of that, but it’s kind of brilliant. Thanks! And boy, oh boy, could my bathroom use an update. love, love, LOVE the yellow!!!!! Our guest room is in need of updating – still reflects our now 20 year old daughter’s “tween” stage. Love the color of your guest room’s walls. Wow thanks for the inspiring post. Everything is so beautiful! You are amazing Dana! How do you do it! You should design my room! 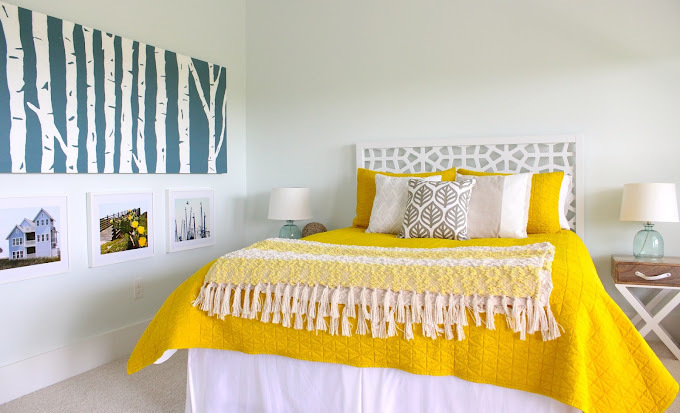 I have bright yellow walls and I never know how to make it as nice as your home looks. Makes me want to have you over to decorate my home. Haha love the room though! Is gorgeous! We’re building a new.house and I’m looking for color inspiration! I.love this pale blue! I’d use it somewhere in our new house! I love the yellow! The first thing that popped into my head for over the bed was starfish, a cluster of different sizes would look really cool. 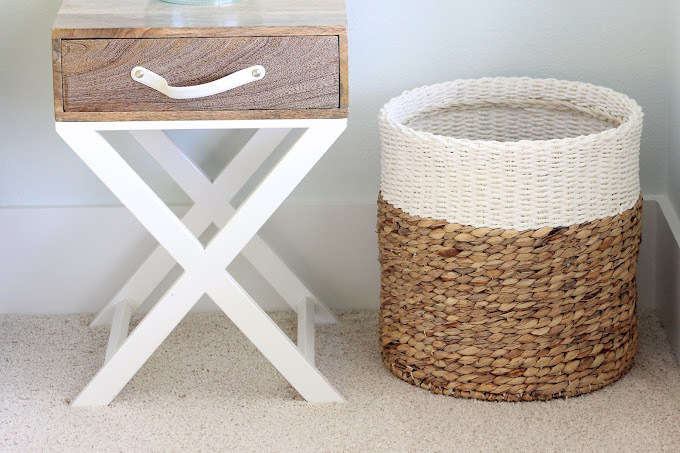 I like the thoughtful touches you gave the room with a basket for dirty laundry and a bag for your guest to use–something to keep in mind if I ever have a guest room. I love your tip on picking a lighter color. I’m in the process of picking a color for my daughters room. I’m hoping to pick a light teal. I love the color of the room. I’m good with picking bold colors, but I shy away from light ones. Definitely leaning towards driftwood, not so much the fish. Such a soothing room. Your guests will never want to leave!!! 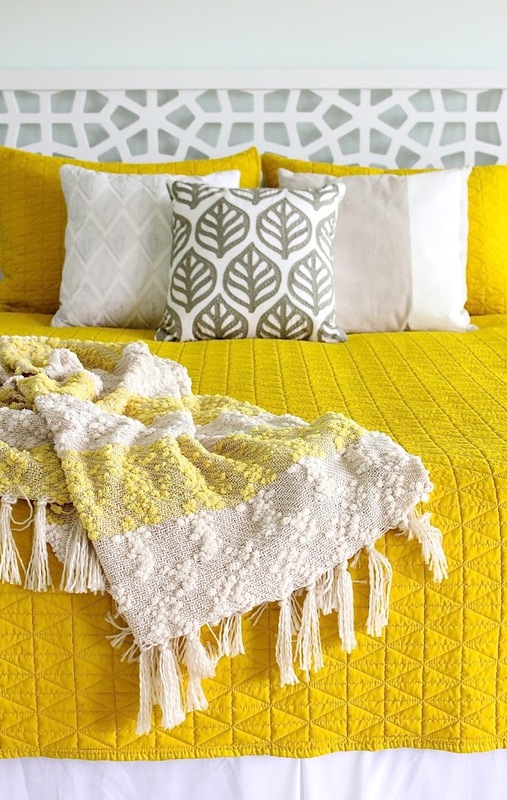 I love the fresh, bright yellow! Love love this guest room. Can I Stay? I love the beach feel! And I totally think you should go with the driftwood. I love the color! It looks great with the yellow! I would hang something simple over the bed, like a garland of sea stars. How about an appropriate sized mirror? I love the tip about not being afraid to paint with light colors. I love the whole room, it is beautiful. i love the colors you’ve chosen. We’re remodeling our kitchen and choosing a color is a difficult choice! Oh gosh, every room in my house needs to be painted. We bought a little 1934 bungalow. It’s cute and tiny and in desperate need of updated paint. Thanks for the chance to win! Ahhh, my dining room needs a fresh look. This would be perfect. Beautiful room! And I love the drift wood idea, but maybe a small shelf with little jars with sand, shells etc. would be nice too. Our family room needs a paint makeover desperately. It has since we moved in seven years ago. Brown walls and gray brown cabinets. There just never seems to be funds for it. I like the idea of driftwood above the bed. Or maybe some sort of garland. Even if you put nothing, it will still be lovely! Thanks for the chance to win. I come here for inspiration so I have no suggestions on something to hang over the bed. I love this room! 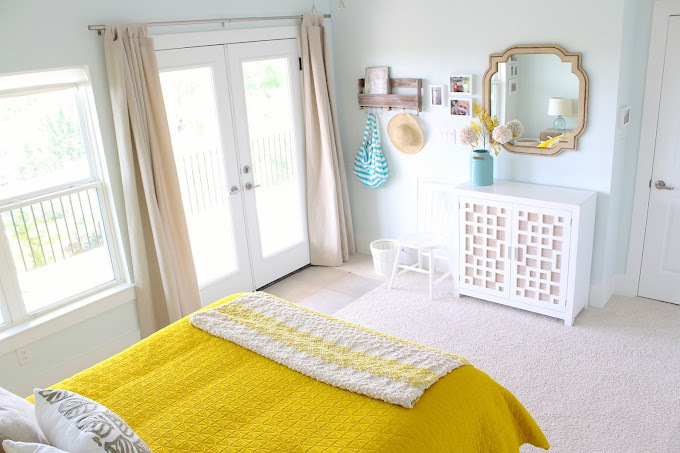 I need to transform my daughter’s room this summer so winning this would be so perfect! I want to finish the room I spend most my life in… The laundry room! Driftwood mirror above the bed. 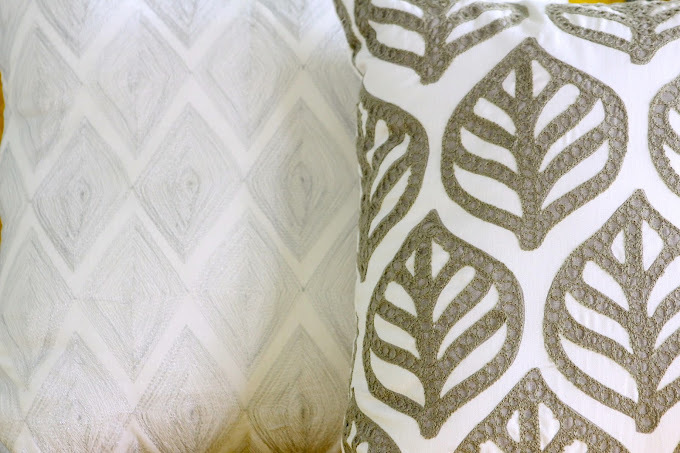 You’re so right about going pale – the wall color you chose is fresh and soothing. Above the bed … a large leafy calcified coral. Beautiful, Dana! 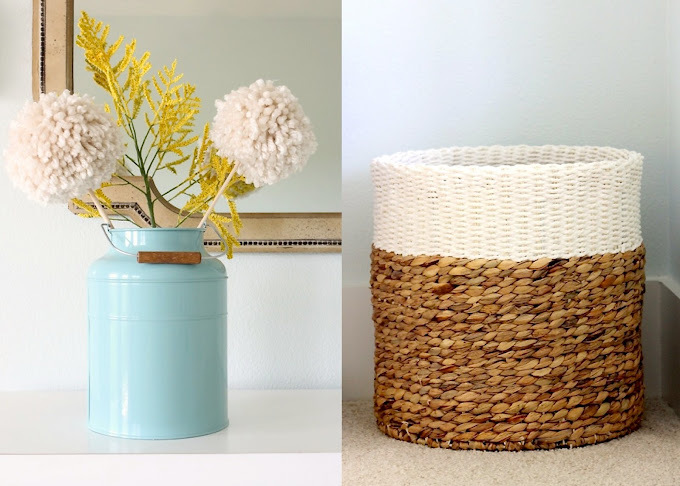 We are moving soon, so I just may have get your advice on paints when we paint the apartment! Also– I vote for driftwood over a fish. I thought that an anchor fits the theme, but may look too cheesy? Depends on the anchor, I guess. This room turned out great! It is so beautiful and soothing. I love how you used old pictures too. I would love to give one of my rooms a paint makeover! Getting ready to paint our bedroom and bath – thanks for the Sherwin Williams tools. Love the room & the driftwood idea! We recently bought a home and while the paint choices were good traditional colors that i can live with they are not relaxing homey colors. And i keep thinking i Will just leave it so i don’t have to reprint when we sell but i want to live here ,now. Love glimmer it is a relaxing color. Love the wall color! 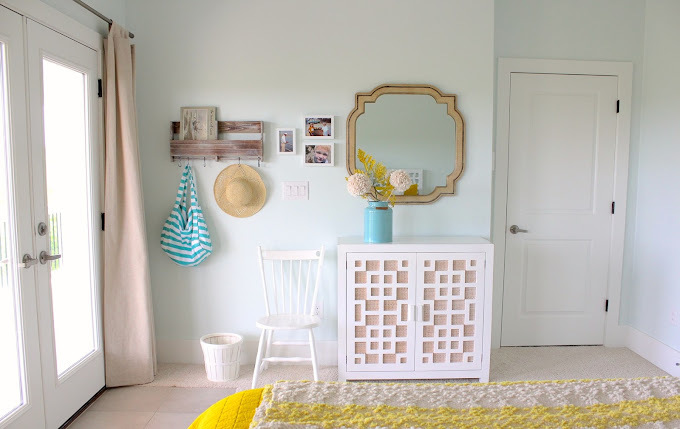 We just painted our bab girls nursery a pale blue, similar to this one, and I LOVE it! What a bright happy room you created. I like the idea of driftwood over the headboard. I’d like to redo my living room. It been dull and boring far too long. d. are you kidding?! i guess having the same birthday = having the same style. I need to visit! I also love the choice of yellow! it’s so lively. Where did you find the Birch painting? Thanks! I actually made the painting!